View of “Lucas Arruda: Deserto-Modelo as above so below,” 2016. First, darkness sets in. 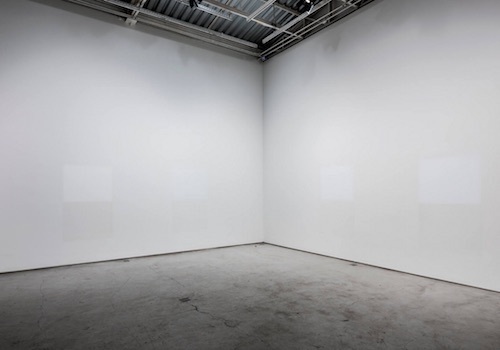 Then, white rectangles of light slowly emerge on the walls, like windows looking out on a blank landscape. As the lights come back on, these luminous intervals start to blend in with the color of the walls until they disappear altogether. At the entrance to Lucas Arruda’s show is a new installation anchored on a cyclical experience of dawn and dusk, harking back to the ancestral idea of painting as a framed mirror of the world. Arruda’s world is devoid of human presence and architecture—empty like his spectral landscapes. His is a deep study of atmosphere, of nothingness. His latest paintings, in tune with the budding oeuvre that has made him one of the most intriguing and coherent painters of the up-and-coming Brazilian scene, depict daybreaks and sunsets, while clinging to a dense palette of whites and yellows, grays and blacks. Oddly, the strength of Arruda’s compositions seems to lie in that lack of structure and substance that make up our vision of the sky and the horizon. Nothing seems to delineate the insignificance of humanity on this planet better than sublime, unimpeded views of an open field or of the sea, sprawling under infinite skies. The artist here subverts that notion of openness with luminous, airy pictures confined to the smallest possible surface. The timid scale of his worldview has the inverse effect of denouncing the heaviness of existence; it lays bare the diffuse design of our environments, and, perhaps, of all that shapes every breath we take.